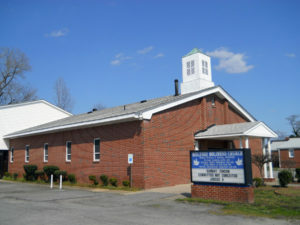 Bishop & Mother William J. Faison, Sr.
Church of God In Christ Jesus, Apostolic, Inc.
ess Church is a stable, Bible based church and has been in existence for more than 67 years. Bishop William J. Faison, Sr. became the pastor in 1957 and he, along with his wife, Mother Mildred Faison led the congregation for over 60 years. Bishop and Mother Faison were blessed with a tremendous vision for the people of God. Their main concern was always the saving of the souls of the lost. Sadly, both have passed away, Mother Faison in 2016 and Bishop Faison in 2017. Many years before his death, Bishop Faison chose and confirmed his assistant pastor, Elder Alton “Tony” Newsome, to be his successor. In August 2017, Elder Newsome was officially installed as the pastor of Bibleway Holiness Church. Bishop Faison taught Elder Newsome many things and had great confidence in him. Elder Newsome’s vision shadows Bishop Faison’s, for he too is concerned about souls being saved and being added to the kingdom of God. Pray for us as we continue to bind ourselves together and honor our parents in Christ and the home in which we worship, and also as we support our new shepherd. We invite you to any or all of our services. Sunday Night Service – 7:30 P.M.
Tuesday Bible Class – 8:00 P.M. Prayer (Tues. & Thurs.) – 7:30 P.M. – 8:00 P.M.
Thursday Missionary Service – 8:00 P.M.